In developing the Art & Arcana project, there were a few details about the visual history of the game that were, well, too arcane even for a book called Art & Arcana. Each of the TSR logos over the years admits of a certain amount of variation, so a slight logo redesign may not warrant the attention of posterity -- but the case of the impostor lizardman sheds light on an overlooked piece of artwork. ... but if you turn to the very last page, the impostor reveals himself. Even without clicking to magnify the images, one can clearly see how the impostor lizardman's legs are largely colored in black, while the inverted Bell lizardman on the Monster Manual cover sports detailed leg musculature. The impostor is imbued with a whole left foot. The blade of his axe is similarly colored solid, except for the edge, in the impostor version, whereas the original has all sorts of textures that appear confusing when minimized. So it was that between Origins and Gen Con in the summer of 1978, the switch was made to the new wizard logo, which would appear on the Players Handbook and the module series beginning with Descent into the Depths of the Earth. If we put it under a microscope, the wizard reveals a bit of detail, but it is iconic, easily recognizable from its outline alone, even when inverted -- and even when miniaturized down to fit the spine of a slender hardcover book to a size where text is practically illegible. 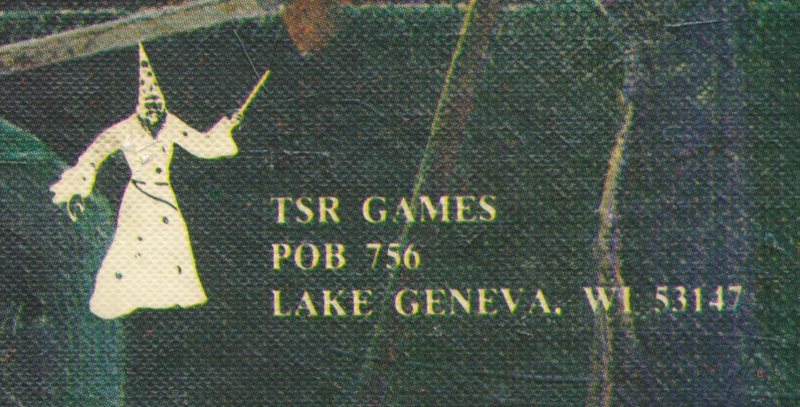 The wizard would last TSR into the 1980s. 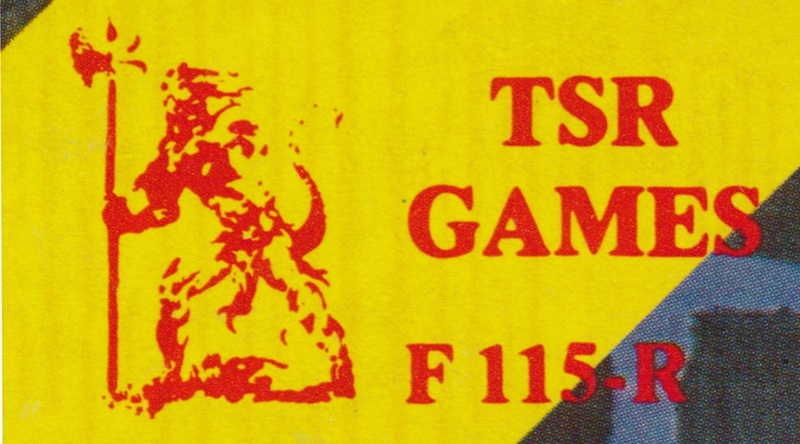 Which version of the lizard logo served as the basis for the Grenadier TSR logo miniature, I wonder? That's a good question. I always assumed the Grenadier lizardmen minis were designed based on Trampier's Monster Manual illustration, but I do know that TSR created and sent some pieces of art specifically to Grenadier for use as model sheets. Neat, I didn't know about that imposter Lizard Logo...! My third print Holmes Box Set (May 1978) has the imposter Lizard Logo! It's on the boxed set covers (front and back), the rulebook (cover, title page and product listing in back) and the Monster & Treasure Assortment included within (code 9011, not sure printing), but the Geomorphs set has the Bell version. I did see impostor lizardmen on the M&TA 1-3 (both yellow and purple), 4-6, and 7-9. Those should all have 90xx product codes. 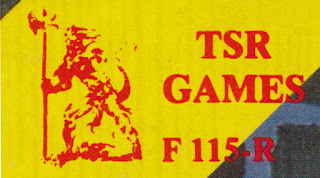 If you can find the F 100x coded ones, they should have a Bell lizardman, as does the cover of the F 1009 character sheets. The update seems spottier on the geomorphs, though, yeah. I miss both lizard men. He has a kind of heraldic majesty that the Wizard lacks. Agreed especially when we went to the comical "Morley" the Wizard. I am responsible for the Wizard being the new logo at TSR. Dad called me up for a break from the shipping department or the Dungeon Hobby Shop I'm not sure which since the transition occurred late in 1977 early 78. Dad called me his office and said that we were expanding our horizons and that the Lizardman was too wargame oriented. I said that Cooty had the Criket and since we were a Fantasy company that we were the "Game Wizards." Dad told me to stay on the clock and to put my feet on the desk and have a Cognac and a Cigar. We spent two hours talking about the future of the company and my role someday in it. The next day though I reported to work as usual under the direction of Brian Blume my direct supervisor. Funny how it was 'back to Blume' despite having that moment to sit back and dream a little, feel the creative gears of something important beneath your feet. A very gygax story. Great breakdown - thank you! Great post! Such deep details on graphic ephemera archaeology with examples. As originally a print design myself, this is fun to see. Now and into the future, in digital, we will not have this ease of tractability and physical history to reference (even with web archives, etc.). As Negtivland and others have discussed, revisionist history and media jamming will be more possible in the digital age. Thanks for the post.